“Theeb” is, in film business terms, a western, a low-tech outdoor adventure story in a somewhat primitive environment in 1916, filled with dangers, especially for a pre-teen boy (Jacir Eid Al-Hwietat). The film, directed by Naji Abu Nowar, puts the viewer in the shoes of characters in a totally alien culture. You could call the film a “Mid-Eastern”. Theeb’s family (with an older brother Hussein (Salameh Al-Sweilhiyeen)) makes a living guiding pilgrims through the desert to Mecca, eventually for the hajj. When a British Officer Edward (Jack Fox) arrives on some sort of mission related to the Ottomans in World War I (which gets very little explanation) Islamic ideals of “radical hospitality” compel the family to help him through the desert. In time, the group is attacked by bandits, and, after tragedy, Theeb is forced to bond with a surviving (and at first badly wounded) robber. The ending of their journey will be ironic, if just. The film, shot in Jordan, offers stunning scenery, with a few images like a saw-tooth mountain range in the background, a shot of a steam train on a single track in the desert. The coming of the railroad is a plot element, as it often is in American westerns. There also shots of Theeb alone with a camel in the desert, reminding one of views of Matt Damon driving a “rent car” alone through the deserts of Mars. Some have compared the visuals in the film to those of “Lawrence of Arabia”. There is also some stunning cinematography of Theeb evading bullets down in a well. The film starred at the Abu Dhabi film festival (as well as festivals in Cairo and Beijing) and was financed largely in Qatar and the UAE. The official Facebook is here (Film Movement). I saw the film before a fair afternoon audience at Landmark E Street in Washington. 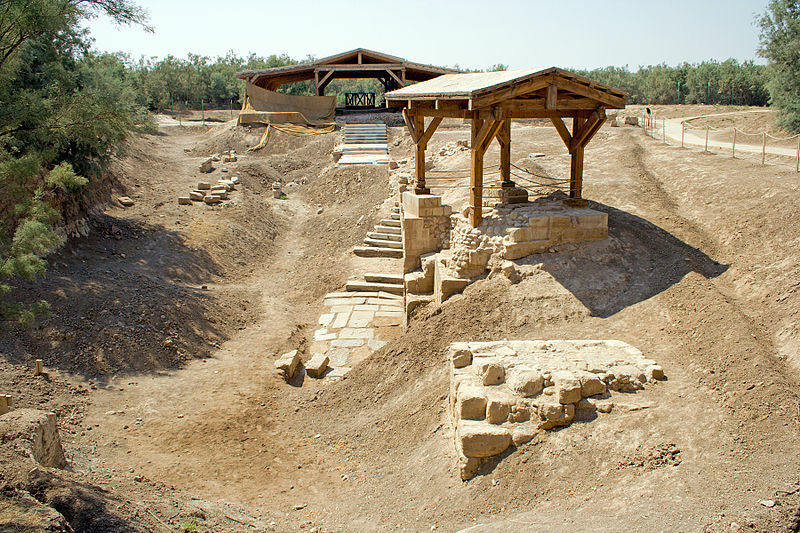 Wikipedia attribution link for picture of a Baptism site in Jordan, taken by David Bjorgen, under Creative Commons 2.5 Share-Alike.